No GMO ingredients. While there may be some globally sourced ingredients, the dog food is produced in the USA. It is hard or impossible for manufacturers to get every single vitamin and mineral from US sources. Real chicken and chicken meal are the top ingredients. I prefer dog foods that offer real meat as the first ingredient. I don’t want to pay good money for cheap fillers like corn, wheat, and soy. No artificial colors or flavors. Just because it is colored to look like a stew doesn’t mean the ingredients are top notch. Thank you Nutro for caring more about dogs and less about sales figures. Extra Omega-3 and Omega-6 fatty acids promote a shiny coat and fabulous skin. Some large breeds, like Labs, can be prone to skin conditions and irritation at times so having a dog food with optimal levels of fats and oils can go a long way towards preventing problems or treating existing ones. No cheap fillers or byproducts ever used. There is also no corn, wheat, or soy. Fruits and veggies provide antioxidant support for a strong immune system. When dog food companies have a variety of fruits and veggies, it shows they realize that dogs like some flavor complexity. I know when my dogs go blueberry or blackberry picking with us, we have to stop them from eating a lot of what is hanging down low! Enhanced levels of glucosamine and chondroitin help provide joint support for large and giant breed dogs. Supplement, Folic Acid, Rosemary Extract. To transition to Nutro, gradually replace your dog’s regular food with Nutro over 6 days. At day 7 they should be eating only Nutro. If your dog has a sensitive stomach then you may want to increase the transition time to up to 10 days. Puppies and nursing mothers may need even more food than that specified by Activity Level III. Consider feeding free choice to mothers and pregnant dogs. Puppies benefit from a series of meals spaced throughout the day and night. This is a quality dog food that I have no major reservations recommending. It is not grain-free, so that may be a deal breaker for some pet parents. It is easy to order on Amazon and you can get a good discount if you set up auto delivery. I am glad to see that there is a 40 lb bag available as well as a 30. In our home, we have three giant dogs and 1 large one so I need food that comes in big bags. 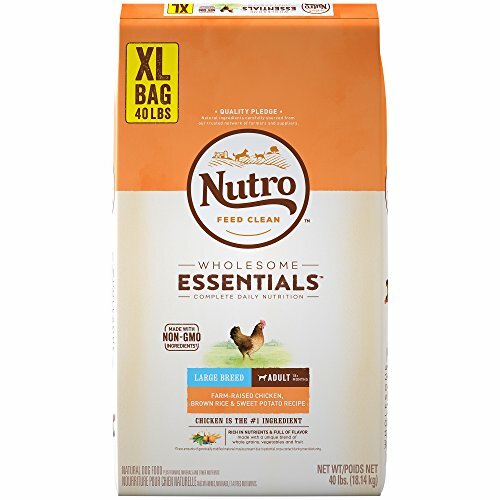 Nutro has very high-quality ingredients and they don’t try to hide their practices or sources of ingredients. I like that they are proud to be GMO-free. There is a 15lb bag size for those that want to try out this great dog food without committing to a large bag. Sometimes it can be good to try out a food for a week to see how your dog adjusts and likes it. A trial period is especially useful if you have a dog that sometimes has a sensitive stomach or any underlying conditions. Nutro is an affordable choice for those that want a formula made just for large breed dogs that is GMO free and produced in the USA.